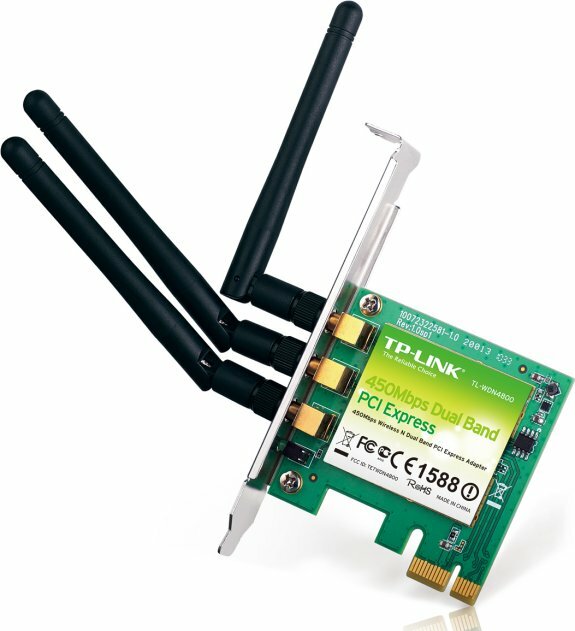 TP-Link, a global provider of networking products, has released its 450Mbps Wireless N Dual Band PCI Express Adapter (TL-WDN4800), which allows users to connect a desktop computer to a wireless network to access a high-speed wireless network connection. The adapter complies with IEEE 802.11a/b/g/n and can access the 2.4GHz or 5GHz channels to provide wireless speeds of up to 450Mbps. The speed is ideal for users seeking a highly robust, bandwidth intensive wireless networking experience for HD video streaming and online gaming. Dual Band technology allows users to connect with a 2.4GHz or 5GHz network. This allows you to check e-mail and browse the Internet using the 2.4GHz band or stream HD movies and other media on the 5GHz band. The 5GHz band provides a distinct advantage because unlike the crowded 2.4GHz band, which is shared with microwaves, cordless phones and other wireless networks, the 5GHz band has much less interference and can provide a more stable wireless signal. Both the adapter’s 2.4GHz and 5GHz bands support the maximum speed of up to 450Mbps, which generates a maximum theoretical wireless throughput. Also included are three antennas to increase wireless performance and stability. Advanced security features such as WPA/WPA2 encryption standards ensure your wireless connection is safe from intruders. TL-WDN4800 comes with a CD utility that makes setting up a network so easy that even for novice users should be up and running in minutes. MSRP of the TL-WDN4800 is $44.99. The adapter supports Windows 7(32/64bits), Windows Vista(32/64bits), Windows XP(32/64bits).